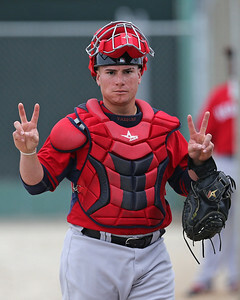 Red Sox coach John Farrell announced today on WEEI that they will call up catcher Christian Vazquez after Ken Rosenthal of Fox Sports reported earlier that AJ Pierzynski was designated for assignment. Farrell also confirmed that Vazquez will start tonight and catch Rubby De La Rosa. The Pawtucket Red Sox have activated catcher Jayson Hernandez from the disabled list to fill the roster spot vacated by Vazquez. The good news for Vazquez has poured in over the last several weeks. On July 2nd it was announced that Vazquez made the International League All-Star team, and the next day it was announced that he was added to the Futures Game to take place over All-Star Weekend. However, Vazquez will no longer be eligible to participate in this game since he will be with the major league team. Vazquez has won all those honors while hitting .279/.336/.385 with 17 doubles, 3 home runs, and 21 walks to 52 strikeouts over 244 at-bats while starting 52 games at catcher and 14 at DH for the Pawtucket Red Sox. Those numbers may not strike the casual observer as elite, but one needs to keep in mind that the offensive standard for a catcher is much lower than other positions. As it has been his entire professional career, what really sets Vazquez apart from his peers is his defensive ability and arm. He has thrown out 35% of attempted basestealers over his seven professional seasons, and this year he has thrown out 40% (19-of-48), a very good rate and reflective of his impressive sub-2.0 second time on throws to second base. Vazquez entered the season ranked #13 on the SoxProspects.com rankings, but his improvement on both sides of the ball has seen his stock rise, and he earns his call-up as the eighth ranked prospect. He still has improvements to be made in his game, but it will be exciting to watch him learn and grow with the guidance of veteran Red Sox catcher David Ross. It is an exciting time for anyone who follows Red Sox prospects as tonight's lineup will feature four current or former top 10 prospects: catcher Christian Vazquez, infielder Xander Bogaerts, infielder/outfielder Mookie Betts, and centerfielder Jackie Bradley.